hairulovchessmaniac: A "Ghost" Draw Offer in...KL Open ! A "Ghost" Draw Offer in...KL Open ! 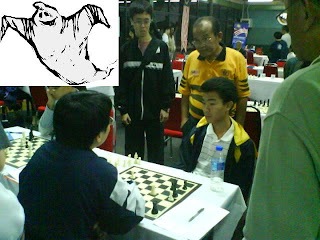 Today i witnessed a "scary" moment in round 7 of the KL Open 2008. A dispute occured in a game between Malaysian - Tan Khai Boon and Singaporean - Benjamin Foo . One of the player claim that his opponent offer a draw... and when the draw offer was accepted, the player who was accused to offer it... denied such thing. Unfortunately there's no witness or arbiter near the table at that particular moment.